Falcao moved to Stamford Bridge in July after an unsuccessful season-long loan at Manchester United, but has scored only once in 11 appearances and not featured since October due to a thigh injury. A contract on the Football Leaks website says Falcao was loaned by Monaco to the Premier League champions free of charge. "It is explicitly agreed that no fee is charged to Chelsea by AS Monaco for the temporary transfer of the player's registration," the document states. 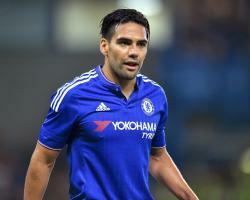 The documents also show that Chelsea have until April 29, 2016 to notify Monaco in writing of their wish to sign Falcao. The fee negotiated is Euros 50million, with half of the sum to be paid within seven days of the option being taken up and the remainder due before July 15, 2017. It appears unlikely the option to buy will be taken up. The Colombia striker was earlier this month linked with a return to Monaco, but the Ligue 1 club said the move fell through due to concerns about his fitness.